Picnicking with the children at the National Gardens on a Saturday has become a common pastime for local Athenian families and is a great way to spend a sunny summer's day when the days are long. The gardens used to be called the Royal Gardens because they were the gardens of the king and the locals are very proud of this lovely green space in a city which doesn't actually have many parks. The gardens have a collection of plants and trees from all over the world and plenty of water features which add coolness in the heat. The Gardens feature a small zoo, duck ponds, resident cats, a Botanical Museum, a playground and lots of wide-open space for children to play in. For children who love books, the gardens are also home to a Children's Library. There are many beautiful areas to relax in the shade and get some respite from the busy city of Athens, and the gardens are also wonderful for walking or running. Locals enjoy playing games together at makeshift tables and often they don't mind if you want to join them. 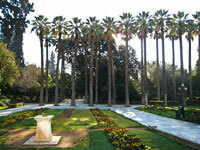 The gardens are located just behind the Greek parliament building, next to Syntagma Square, and are easy to locate.